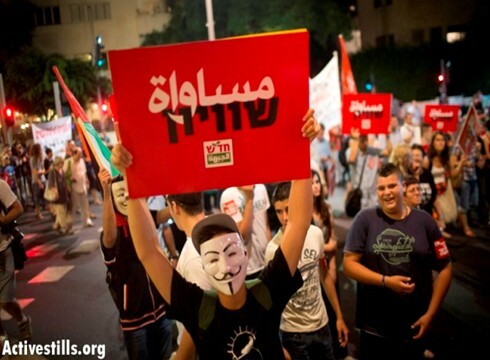 Thousands marched through the streets of Tel Aviv Saturday night in protest of the Prawer Plan. Alongside Tel Aviv residents, demonstrators were bused in from Arab villages and cities in the Galilee and the Negev to gather in Habima Square. Most of the demonstrators were affiliated with Hadash, a few with Meretz and many more were politically unaligned. Among the protesters: MKs Muhammad Barakeh (Hadash), Dov Khenin (Hadash) and Tamar Zandberg (Meretz), fomer MKs Tamar Gozansky and Issam Makhoul (Hadash) and members ol the Central Committee of the Communist Party of Israel. At 8 p.m. the procession started moving through some of central Tel Aviv’s main streets heading toward Likud’s headquarters on King George St. The Prawer Plan, which passed its first Knesset reading in last June, is expected to be brought for the second and third readings toward the end of September, immediately following the Jewish holidays. Saturday’s demonstration was led by residents of Al Araqib, the Arab-Bedouin village destroyed by police over 50 times in the past years. Last Tuesday Al Araqib was demolished yet again, and four village residents were detained and initially prohibited from returning to their lands until a court overturned this decision. Speakers at the event said the state is planning a mass deportation of Arab- Bedouins from their homes while promoting the establishment of new Jewish villages and towns on the same land. They called upon the government to scratch the Prawer Plan and find a solution to problems in the Negev in a joint effort with and for the benefit of all its residents.